These days, it seems like everything under the sun, and even the sun itself, causes cancer. A recent study shows that cancer may cause yet another hardship for those diagnosed—Bankruptcy. There are a number of reasons for this. A patient may be unable to work during treatment or only able to earn an income during periods of remission. However, the primary cause is the enormous medical expense associated with the treatment of cancer, especially for those who are uninsured or under insured. The study, “Cancer diagnosis as a risk factor for personal bankruptcy,” published in the Journal of Clinical Oncology, examined 231,799 cancer patients, and found that 4,805 of them, or 2.1 percent sought bankruptcy relief under Chapter 7 and Chapter 13 in the years following their cancer diagnoses. This corresponds to about a 700% increase in the incidence bankruptcy filings over that of the general population. The study also found that certain types of cancer resulted in significantly higher rates of bankruptcy. Patients afflicted with lung, thyroid and leukemia/lymphoma cancers were most likely to seek bankruptcy protection, with 7.7 percent of lung cancer patients filing for bankruptcy within five years of being diagnosed. The study also found that surgery and chemotherapy increased the risk that some cancer patients would file for bankruptcy. 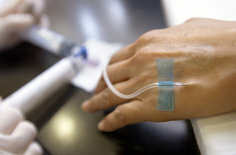 Researchers concluded that medical bills are a primary cause of the connection between cancer and bankruptcy because younger cancer patients sought bankruptcy relief at higher rates than older cancer sufferers. They believed this was due to the fact that older Americans have access to Medicare, and therefore do not bear the same costs for cancer treatment as younger patients.